Baby, It's C-C-COLD Outside...Or, It will be Soon! HVAC business is ramping up with Old Man Winter on the way. Serve as an educational resource to your customers by sharing some important, seasonal HVAC tips to get them ready for winter. Share these ideas with them in person, through direct mail and social media channels. Consider running a "Prepare for Winter" special that encourages customers to schedule a seasonal HVAC system check-up. Suggest to clients that they schedule the check-up right away — before they switch on the furnace, boiler or heat pump on a cold winter day only to find out it's not working properly. It's important to keep the heat inside rather than letting it escape through drafty doors or windows. Customers can use caulk or weather stripping to seal air leaks at home. Since warm air rises, clients should set ceiling fans to run at low-speed in a direction that pulls cooler air up from the center of the room and pushes warm air back down into the living space. To check a ceiling fan for proper direction, turn it on high and stand directly beneath it. The fan should be running in a clockwise rotation if looking up at it. You should not feel air blowing down from the fan. 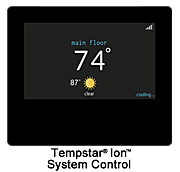 If customers are not yet using a programmable thermostat, suggest the Tempstar® Ion™ System Control to them. The Ion System Control makes it easy to turn down the temperature while everyone is at work/school (and no one is using the space) and warm the house up before the family arrives back home. Remind customers that HVAC technology — just like other forms of technology — is always improving. If it's been awhile since they've invested in a new furnace, their existing unit may have an AFUE rating as low as 60 percent. Explain that AFUE works in much the same way as "miles per gallon" does on a car: the higher the AFUE number, the higher the efficiency and the more they could save on energy costs over time. A new Tempstar® Deluxe 98 gas furnace could lead to substantial savings on heating bills, compared to an older 60 percent AFUE model. 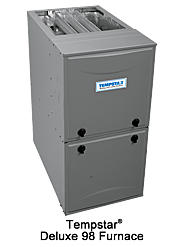 Tempstar® Heating and Cooling Products has an extensive line of high-efficiency furnaces to choose from. Help your customers make the right decision for their comfort needs as well as their budget. Then, make sure to schedule the furnace installation before Old Man Winter arrives. Hopefully your customers find these energy-saving tips helpful. Whether you are working with a client in person, through direct mail or via social media channels, be an HVAC educator. Help them learn more about their heating and cooling equipment, how to properly maintain it and how to stay warm and comfortable this winter without breaking the bank.